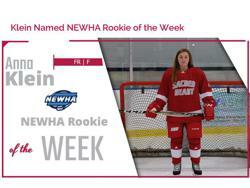 Sacred Heart Women's Ice Hockey forward Anna Klein was named the NEWHA Rookie of the Week as announced by the Association this afternoon. Klein helped lead the Pioneers to a pair of victories against Post this weekend. The freshman tallied a goal and an assist for total of two points to wrap up the weekend sweep. Klein is currently third on team in goals with three on the young season. Sophomore goalie Kalya Walewski and sophomore forward Lexi Edwards were named to the NEWHA Honor Roll as well. Walewski to the Defensive Player of the Week Honor Roll while Edwards was named to the Player of the Week Honor Roll. The team returns to action on Friday, Nov. 16, when the Pioneers host Franklin Pierce. Puck-Drop is set for 4:00 p.m.